With 3,900 square feet to call home, this stunning home is perfect for large families. 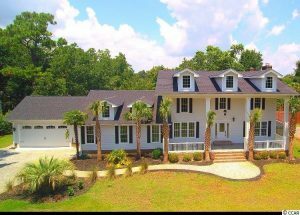 This transitional southern home has 5 bedrooms, 5 bathrooms, and 1 partial bath and is located in the Dunes Club in Myrtle Beach. This home has been remodeled from top to bottom. On the exterior, there is all new siding, windows, landscaping, driveway, and a new roof! On the inside, this beautiful home futures a new wine display with wrought iron gates, brand new hardwood flooring, crown molding, and more. A brand new master bedroom was added on the first floor and is complete with tray ceilings, walk in closet, and a master bathroom with a huge shower and separate soaking tub. There is a formal living room with a fireplace plus a formal dining room that is perfect for family dinners. The family room also has a fireplace and a wet bar. The kitchen features all new cabinets, granite counter tops, and Viking appliances. The backyard features a brand new deck and all brick fire pit. This home has everything you could ever want, and more. Give us a call today to schedule a showing!